Intel® Quick Sync Video is a technology that allows to offload some tasks such as video decoding and encoding to the GPU and reduce the CPU usage. ManyCam 6 has widened the range of supported encoding options and now allows utilizing Quick Sync along with the default encoder used in the previous versions. This guide will show you how to enable Intel® Quick Sync Video on desktops with external GPU (e.g. Nvidia). This new feature is currently available for RTMP streaming and Video recording only. Find your CPU at Intel Product Specifications website and make sure Intel® Quick Sync Video feature is on the list of your CPU specs and marked as “Yes”. Reboot your machine, enter the BIOS and find and enable internal Intel® graphics (iGPU, integrated graphics). Download and install the latest drivers for your graphics adapter from Intel Download Center. The option will be grayed out until all requirements are met. 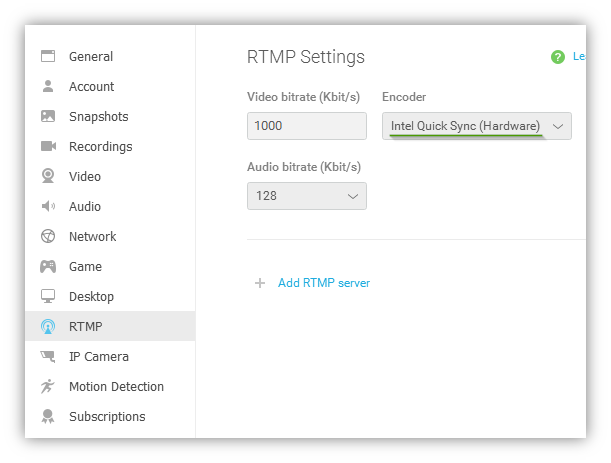 In case you need to use the Intel® Quick Sync encoder for video recording, go to ManyCam’s Recordings settings and select the encoder the same way as in RTMP.